When setting up a preclinical in vivo imaging laboratory, a number of factors have to be taken into account. These will include the use of dedicated imaging systems and the predicted and accurate workflow of studies that will have to be performed. Other aspects of laboratory set-up would also need to be considered to meet both regulatory and safety needs and to enable routine laboratory productivity. This article presents all these considerations and also brings attention to software and system considerations, common site requirements, solutions for animal care, imaging accessory needs, as well as personnel considerations and safety training required for outfitting both single and multimodality preclinical imaging labs. Further, system specific support workforce can additionally support site requirements for certain imaging systems. This would ensure that details regarding installation of the system, weight tolerance, and clearance would be easily available. Likewise, local and national agency guidelines should be taken into account for systems that utilize or generate ionizing radiation. For systems demanding complete considerations for room engineering, it would be useful to consult contract engineers during the initial phase of the facility design. Irrespective of particular modalities (Table 1), certain considerations may be common for all preclinical labs. For instance, the need for animal transport solutions, preparation and monitoring of animals, anesthesia delivery, and data management will be standard amongst a large number of facilities. Customized solutions for these areas of concerns can be developed to suit the goal of specific laboratories. In any imaging laboratory, transporting animals to an imaging facility takes the highest priority. With respect to imaging facilities where multiple investigators use the same imaging system, this can pose a challenging problem because issues may occur when transporting animals from an animal housing facility to an imaging facility. The animal housing facility will normally use isolation and barrier policies, which would otherwise be lacking in a standard imaging facility. Most imaging facilities dedicated for institutions are developed within the animal housing area of the facility. Such an approach could help address the transport and barrier logistical concerns in imaging facilities. Nevertheless, even when animals are kept in a housing facility, animals would still need to be isolated during transportation and imaging. Therefore, a suitable solution is needed to address this issue. In-Vivo Xtreme™ II SPF animal chamber (SPFC) is an SPF compatible accessory integrated with HEPA filters (Figure 1). It has been specifically designed to meet such animal handling needs. Since it is important to manage and prepare animal(s) under sterilized conditions, supporting infrastructure, including sterile biosafety cabinets and clean benches, are required. Figure 1. SPF Compatible Imaging Chamber in the In-Vivo Xtreme II. Chamber is equipped with HEPA filters and quick-connect gas tubing. Quick gas connectors for SPFCs are also required for transporting animals to and from staging areas. Other factors that need to be taken into account are end-user safety and optimized delivery of anesthesia for preparation and imaging of animals. Further, the anesthesia setup design should include storage and access to anesthetics supplies, which comply with legal and regulatory requirements; ventilation and scavenging solutions; and appropriate mounting solutions for carrier gas cylinders. Several solutions are provided by Bruker to enable both safe and functional delivery of gas anesthesia. Numerous EquaFlow manifolds, for instance, for 1 rat, 3 mice or 5 mice, can be integrated in the in-Vivo Xtreme II system. These manifolds in turn are linked to an activated carbon scavenging system. They are capable of distributing an equal dose of anesthesia to each individual nose cone. Such uniform distribution of anesthesia is important when imaging kinetic reactions, in vivo bio-distribution, or a combination of both. This is because different anesthetic conditions as well as hypoxic environments can interfere with the enzymatic reactions. Anesthesia systems supplied by Bruker utilize medical air or oxygen as carrier gases. More and more institutional imaging equipments are being deployed in a centralized site, where different platforms are placed closely together. The Multimodal Animal Beds (MMABs) from Bruker (Figure 2) not only improve the imaging potential, but also enable cross-platform multimodal imaging. They can be easily transported between Bruker’s imaging systems, such as the SkyScan microCT® 1176 and 1278, In-Vivo Xtreme I & II, BioSpec MRI systems, Albira II, ICON™ MRI system, PET/MR 3T, and Si PET/SPECT/CT. All these systems are compatible with the Bruker MMAB. Figure 2. Bruker MMAB and adapters. (A) In-Vivo Xtreme I & II adapter. (B) SkyScan microCT adapter. (C) Albira II & Si PET/SPECT/CT adapter. (D) MMAB chamber. (E) ICON MRI adapter. 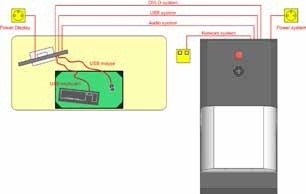 Animal monitoring may also require hardware solutions such as cardiac, respiratory and body temperature monitoring, during the preparation and imaging of samples. The Bruker MMABs are designed to support these factors. Moreover, sufficient lab space should be available to carry out procedures, and compartments for decontaminated materials, in addition, syringes and other lab consumables must be included. Besides these, interim animal cages, sterile hoods, etc. should also be taken into account. Other considerations include data management, data storage and reconstruction solutions, and backup solutions. These measures would facilitate consistent data retrieval, cloud solutions, and dedicated server configurations. In addition, certain applications may involve extensive imaging analysis. Thus, based on the extent of equipment usage, individual workstations should be configured with adequate processers to support complex image analyses. Optical imaging is a technique that involves streamlined acquisition and analysis processing along with minimum overhead cost, reduced integration needs, and minimal system footprint. Therefore, optical imaging is deemed to be the most readily available preclinical imaging modality. 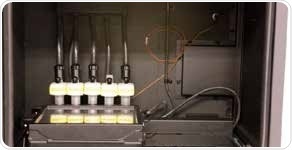 The Bruker In-Vivo Xtreme is a preclinical optical imaging system (Figure 3) that can be deployed without altering an existing lab setting. 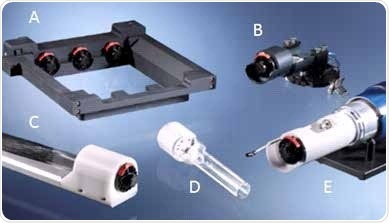 An optical system basically needs system clearance requirements, power requirements, environmental working conditions, and other tangential needs to sustain optical imaging studies. Figure 3. In-Vivo Xtreme optical multimodal imaging system. System conforms to cabinet X-ray standards with interlocks and integrated shielding. Multimodal optical imaging solutions provide X-ray, radioisotopic imaging or a combination of both, and therefore regulations for radiation safety would be required. Labs that are planning to utilize PET or SPECT radionuclides will need to conform to applicable institutional radiation regulations. FLI, BLI, DRI, CLI, and X-ray imaging are provided by the multimodal In-Vivo Xtreme systems. These systems generate less than 0.5mr/hr at 5cm from the cabinet, and are deemed to fully protected systems. They comply with NF, TUV, FDA regulation CFR 1020.40 and C 74-100 for X-ray cabinet systems. Therefore, the systems can be used in standard lab settings without requiring any external protection. They are also integrated with safety mechanisms, including fail-safe interlocks, (Figure 4). Figure 4. X-ray safety mechanism flow chart of a Bruker In-Vivo Xtreme optical multimodal imaging system. Preclinical optical imaging allows critical, high sensitivity and high throughput imaging capabilities for disease model systems as well as for cell tracking. Non-imaging specialists can be trained to achieve and study optical imaging data. Given that many scientists use optical imaging systems for animal studies, it is important to access image analysis tools. New personnel should be trained on how to use these systems. The In-Vivo Xtreme system also comes with a site license for the Molecular Imaging Software by Bruker. As a result, users can easily access the software analysis features to analyze the optical imaging data. 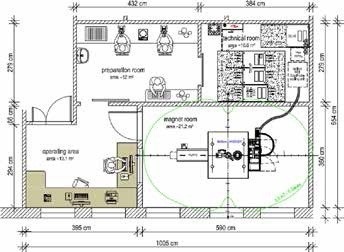 Preclinical PET imaging can be supported with some level of planning and site preparation. 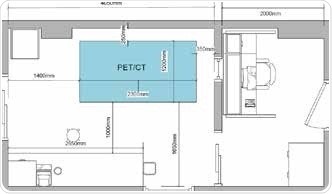 Optimal layout for workflow is one of the few considerations required for μpet laboratories, but many factors meant for μpet laboratories are also relevant to μspect laboratories. While commercially available benchtop μpet systems can be accommodated in the available space, they come with certain drawbacks such as high dead-time errors, low resolution imaging, and small axial FOVs. μpet systems offer good performance specifications which include greater than 9% sensitivity, sub-millimeter resolution, built-in anatomical modalities, large FOV, and/or built-in SPECT. Despite these features, more space will be needed for this type of systems. In contrast, the Bruker Albira Si PET system has excellent performance specifications and is supplied with SPECT and/or CT components integrated in a compact platform. With integrated CT, attenuation correction and anatomical localization can be realized for PET. Similar to the Bruker Albira Si PET system, the Bruker PET/MR 3T system uses the same high performance and advanced PET detector. The Bruker PET has a unique design that integrates silicon pmts. These pmts are insensitive to MR interference, and thus eliminates the necessity for RF-shielding. In any preclinical lab, the optimum layout will differ based on regulatory variables. Figure 5 illustrates a typical floor plan with space assigned for storage plus a dedicated control room. Figure 5. Example floor plan for the Albira Si PET/SPECT/CT system. The system layout should be designed in such a way that the workflow of animals, people, and radioactive compounds are fully optimized. As such, it is critical to manage and store isotopes, including animals and radioactive waste. Turnkey systems are available for animal preparation and shielded dose; end-user shielding for storage of isotopes; and for safe and secured storage of active animals. An institutional RSO handles a radiation safety program, which comprises personnel training to reduce exposure, radiation surveys through counters or wipes where personal dosimetry hardware may be used to make sure that exposure limits are kept to a minimum. Further, access and proximity to radioisotopes for lab-relevant applications are other considerations for μpet labs. 18FDG is perhaps the most typical PET isotope utilized in preclinical and clinical studies. It is applicable to studies in metabolic, neurology, oncology, and cardiology. Other radionuclides such as 89Zr and 11C are also utilized in preclinical PET imaging. However, a trained radiochemist will be required for customized radiochemistry as well as tracer development. A dedicated hot rack should be provided in the room to keep radioactive animals before and after PET acquisitions; a cold rack to keep the animals for the length of the study; and a biosafety cabinet to carry out animal care. Micropet imaging calls for a certain level of expertise for fundamental imaging applications. A high degree of expertise is required for applications involving kinetic imaging, kinetic modeling, tracer development, and functional cardiac applications. Advanced analysis software packages have been developed for μpet image analysis of kinetic modeling, brain studies, and certain disease models; however, this would require extensive training. The SkyScan 1176 or 1278 is an advanced and compact μCT system that requires only basic changes for laboratory use. Figure 6 shows a typical layout of a μCT system. Contemporary scanners are self-protected cabinet systems, and come with multiple emergency stops and safety interlocks to avert unintended radiation exposure to systems operators. These features prevent the need for separate remote operator rooms. Nonetheless, the μCT systems require some level of environmental considerations. These systems feature sensitive electronics and utilize highly accurate movements during PET acquisitions. They should be used within the specified temperature and humidity ranges. Figure 6. Example floor plan for the SkyScan 1176 preclinical μCT system. MicroCT system shown at right and workstation shown at left. The type of application governs the expertise requirement for μCT analysis and imaging. In vivo μCT systems are often used for imaging and studying pulmonary disease, bone disease, obesity models, and cardiac/disease function models. This application-specific analysis differs from fundamental image segmentation to complicated cardiac function analysis. While fat, bone, and lungs exhibit natural contrast, most soft tissue applications can be enhanced using suitable contrast agents such as iodine based compounds, gold nanoparticles, etc. As such, gated imaging and animal monitoring may be needed in certain pulmonary and cardiac applications. A rugged physiological monitoring system integrated in Bruker’s in vivo μCT systems is capable of determining the heart rate, breathing rate as well as ambient temperature. The μCT systems also communicate with external devices that can be utilized to track or ventilate the animal’s physiological condition. Figure 7 shows Bruker’s SkyScan 1176 in vivo μCT system, which deliver high resolution and Bruker’s SkyScan 1278, which provide high speed imaging. Figure 7. SkyScan 1278 μCT system and workstation. The systems have compact footprints and comply with FDA regulation CFR 1020.40 for X-ray cabinet systems, offering integrated shielding and safety designs. Analysis of high resolution μCT datasets is a resource- and time-intensive process. As such, a complete software package has been developed by Bruker to address the complex data processing needs of μCT imaging. The software allows for rapid reconstruction and analysis with an easy-to-use graphical user interface (GUI) interface, which includes high-tech features like batch processing of various datasets, automated segmentation, analysis of bone mineral density, etc. The in vivo μCT system is supplied with computers that utilize a Windows-based operating system. Bruker’s systems provide on-site training and support for questions related to specific applications. The company hosts yearly microCT workshops and user meetings at different parts of the globe to introduce innovative applications as well as new software and hardware features. 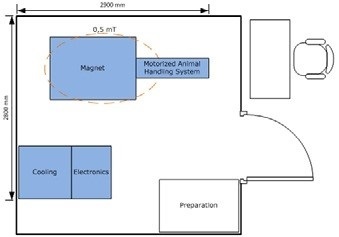 Based on the configuration of the system, location of the system, and magnetic field strength, moderate-to-extensive planning and infrastructure would be needed for preclinical MRI systems. For operators with low-to-moderate technical expertise, low field systems provide a suitable solution. Likewise, for operators with moderate-to-high levels of expertise, higher field systems would prove suitable. Certain factors have to be taken into account when choosing the right MRI field strength for an imaging facility. The system’s bore size and the system’s magnet field strength often determine the maximum size of the sample for imaging purposes. Imaging of rat or guinea pig would call for a larger bore size, limiting the field strength to below 11.7 T, while imaging of primates require even larger bore sizes, restricting the field strength to 4.7 or 7T. The 1T ICON system is compact, lightweight, and needs minimum infrastructure and maintenance. It shares a similar layout with the BioSpec 3T (Figure 8), but eliminates unnecessary floor space that is otherwise required for electronics and a cooling unit. Figure 8. 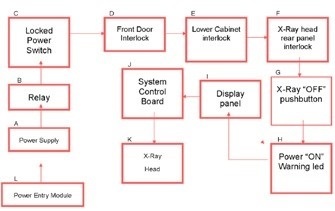 Example floor plan for a BioSpec 3T USR MR. The 1T ICON features a permanent magnet design, and the magnet remains charged even when there is a power failure. This reduces downtime during such instances. The scanner design is self-protected and prevents electromagnetic interference from adjoining lab devices, thereby eliminating the need for a Faraday cage. The ICON system is also user-friendly. The latest BioSpec 3T magnet system is free of cryogen and requires low-to-moderate maintenance. The design of the cryogen-free magnet prevents the need for nitrogen or liquid helium fills and also prevents the necessity of quench exhaust for venting the cryogens. The BioSpec 3T includes touchscreen operation to ensure a simple and accurate workflow, and comes with a motorized animal handling and positioning system. Similar to the Albira Si PET system, the Bruker PET/MR 3T system utilizes the same silicon PET detectors to provide integrated inline PET. Moderate-to-extensive preparation and site planning would be required for higher field BioSpec magnet systems. Figure 9 illustrates a typical example floor plan for a high field BioSpec 94/20 USR system. A quench line is needed in these systems to vent cryogenic gases, and in certain situations, can be used to reduce electromagnetic interference. The BioSpec systems are capable of capturing images with higher SNR and these in turn can be used for generating high-resolution images. When integrated with MRI Cryoprobe™, high field systems can acquire in-plane resolutions of 20μm. Further, the choice of amplifiers and gradient coils will restrict the resolution of the scanner. Bruker provides these products that permit gradient strengths as high as 1,000mT/m. Based on the scanner’s field strength, the MRI Cryoprobetm provided by Bruker can additionally improve the SNR levels by a factor of 2.5-4. The lower scan times can translate into increase scanner throughput, but further site planning and infrastructure would be needed. In preclinical MR laboratories, the level of imaging expertise for personnel differs from general biologists to MR physicists. In certain MRI applications, animal monitoring as well as respiratory and cardiac gating has to be performed. When using the MRI product line, a steady-state and self gated cardiac imaging technique called intragate can be used. This method eliminates the need for hardware, external sensors, and triggering devices. 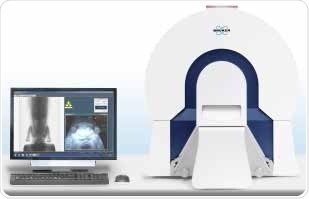 The topspin software and the ParaVision software are used to configure the MRI systems supplied by Bruker. The software supports all stages of MR operation, including custom coding alternatives for sophisticated sequence programming and presets for traditional anatomical applications. A number of factors have to be taken into account when setting up preclinical imaging facilities. Irrespective of modality, certain considerations are standard. However, special attention has to be paid to animal handling and care. Functional modalities exhibit explicit considerations for tracer access and proximity, radiation storage, chemistry, and waste solutions. Individual modalities call for certain requirements to ensure effective imaging. Peripheral equipment is also required by some modalities for effective imaging. While standard performance properties differ based on the modality, they can comprise multimodal potential, imaging speed, resolution, and sensitivity. Analysis and application expertise are equally critical to perform complicated analyses. Bruker supplies a complete set of preclinical in vivo imaging equipment, such as multimodal optical systems, SPECT and PET systems, microCT systems, and MRI systems. Supported by applications personnel, these systems deliver industry leading performance. 3Notre Dame Integrated Imaging Facility, University of Notre Dame, Notre Dame, IN 46556. Velikyan I (2014) Prospective of 68Ga-Radiopharmaceutical Development. Theranostics. 4(1):47–80. Van Dongen GA, Huisman MC, Boellaard R, Harry Hendrikse N, Windhorst AD, Visser GW, Molthoff CF, Vugts DJ. (2015) 89Zr-immuno-PET for imaging of long circulating drugs and disease targets: why, how and when to be applied? Q J Nucl Med Mol Imaging. 59(1):18-38. Petrik M, Zhai C, Novy Z, Urbanek L, Haas H, Decristoforo C (2015) In Vitro and In Vivo Comparison of Selected Ga-68 and Zr-89 Labelled Siderophores. Mol Imaging Biol. DOI:10.1007/s11307-015-0897-6.